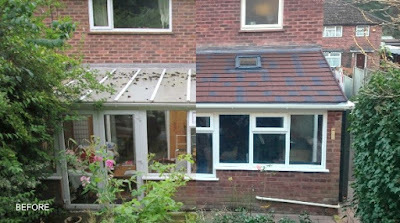 Do you limit the use of your conservatory because if can feel too hot in the summer of too chilly in the winter? 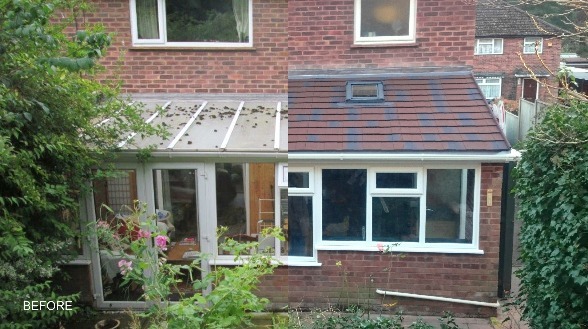 Your conservatory could be given a new lease of life by replacing the existing roof with a Horsford Warm Roof. The Horsford Warm Roof is an innovative roofing system designed for conservatories, which offers greater insulation, energy efficiency and style options than traditional roofing, whilst reducing necessary maintenance. By offering a more constant temperature, choice of designs and pleasing appearance, it could completely alter the way you use your conservatory. You could turn your conservatory into a new dining area or lounge, in the knowledge that it will maintain a more constant year-round temperature. With the option of a tile or slate finish on the outside and a vaulted or lowered flat ceiling on the inside, it will also give your conservatory a whole new look! The Warm Roof insulation system gives a U-Value of 0.15 W/m2 andthe tiles carry a 25-year guarantee. We’re pleased to also offer a Warm Roof system for orangeries, enabling you to replace your existing roof (possibly a flat one in some older builds), with a lightweight, more thermally efficient pitched version, incorporating composite slates with the traditional roof lantern.